What should your window treatments do? Windows bring natural light into a room and sometimes that light can be overwhelming. Homeowners with bare windows are often surprised at how quickly furnishings can fade. Wood and upholstered furniture, carpets, wallpaper and artwork can all be affected by exposure to direct sun. 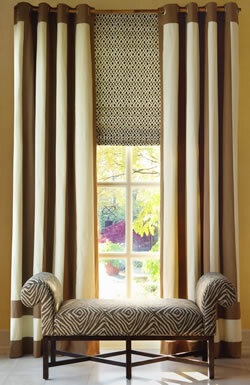 Window treatments help protect your investment in all your furnishings. We can design custom window treatments to provide degrees of light control or block it completely. Sheers and window shades can filter light and control glare. To block light, choose draperies that draw, use interlining or blackout lining, or add blinds or shutters beneath decorative window treatments. Window treatments can complement and frame a beautiful view — or obscure a less desirable one. To enhance a great view, consider treatments that stack off the window and don't compete with the landscape. This also gives the illusion of a larger window — an added bonus. 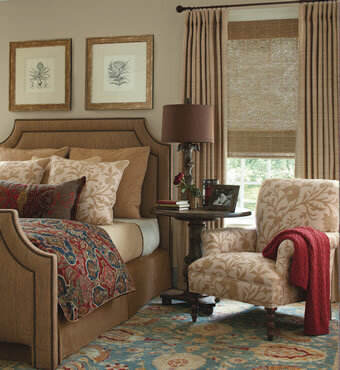 You might choose fabrics in a similar color as the walls, perhaps adding subtle color accents in trimming or banding. 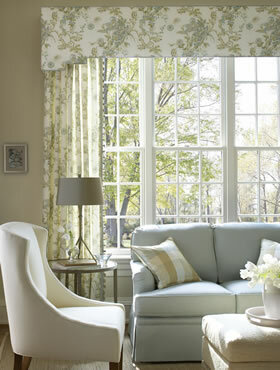 To detract from less than ideal views, choose window treatments that overhang the window, with sheers or lace beneath. Valances, cornices or swags can also help, while adding a decorative accent. 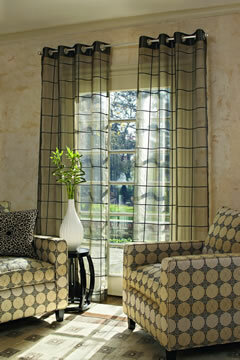 Translucent fabric shades can provide a filtered view beneath decorative drapery side panels. A beautiful view by day can become a window for the neighbors when interior lights are on at night. If you don't want to see your home lit up like a cruise ship, choose window treatments that draw or close in the evening. Or add blinds or shades behind decorative window treatments or side panels. Alternatively, add a lining (made like a drapery) on a separate track behind sheers or casements so that you can have filtered light during the day and compete privacy at night. Window treatments that provide privacy are especially important in bedrooms, baths and dressing areas for obvious reasons. They help create a feeling of intimacy in the master bedroom. 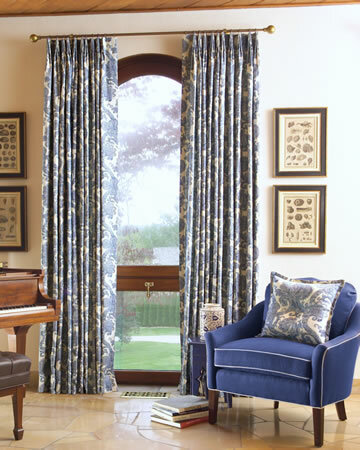 Window treatments add layers of fabric at the window to deflect frigid air or blazing heat. They can make your rooms more comfortable and improve the energy efficiency of your home. On the flip side, if window treatments are designed to open as much as possible, cool breezes can circulate through open windows on balmy days. Through the use of lining and interlining, soft window treatments can absorb sound and buffer street noise, making a significant difference in how your home feels to your family and guests. We've all been in noisy restaurants with hard surfaces everywhere — they lack fabric window coverings, upholstery or carpets to absorb sound. The same principle applies to the rooms in your home. Draperies that are interlined offer the maximum noise absorption.
? Why Choose Custom Window Treatments?